Announcing “Come as you are,” a transgender women’s summit in Kansas City! The first major transgender summit in years will be held at the Embassy Suites Plaza hotel from 7-9 February, 2014. 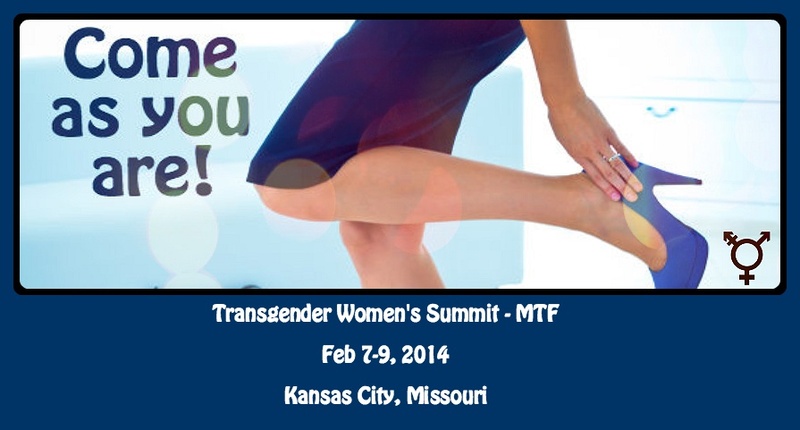 Organized by the Transgender Institute on behalf of the transgender community, this summit is the first of two which will be held in early 2014 right here in Kansas City! The summit will feature guest speakers such as State Senator Jolie Justus, Facial Feminization Surgeon Dr. Alexander Sinclair, Reassignment Surgeon Dr. Toby Metzler, and Spiritual Speaker Dr. Donna Ross. Various workshops will be available on fashion, makeup, nails, comportment and feminization, self-defense, employment law, and other topics. If that’s not enough, two SOFFA meetings will be hosted by my wife for Significant Others, Family, Friends and Allies of transgender people – and yours truly will be interviewing an interesting transgender person for the audience. More information can be found by clicking this link. This entry was posted in Uncategorized on December 21, 2013 by . who would be an interesting transgender person?